Background: Classic Takotsubo cardiomyopathy has been described as transient apical dyskinesia following major stress that is believed to be related to catecholamine surges. Atypical variants have been described, including the rarer reverse Takotsubo cardiomyopathy. Discrepant gradients of the beta-2 adrenoceptors are thought to determine the different anatomic variants. Case Report: A 43-year-old female presented with chest pain and a mild troponin elevation. Echocardiography and coronary angiography were consistent with stress-induced apical Takotsubo cardiomyopathy. Eight months later, the patient was admitted with a similar presentation; however, workup revealed stress-induced reverse Takotsubo cardiomyopathy. Conclusion: Recurrent Takotsubo cardiomyopathy involving different anatomic regions of the left ventricle is a rare phenomenon yet appears to be similar to typical Takotsubo cardiomyopathy in presentation and hospital course. Chronic therapy with beta blockers and angiotensin-converting enzyme inhibitors did not prevent a recurrence in this patient, suggesting that optimum treatment needs to be determined. Takotsubo cardiomyopathy affecting different myocardial segments may recur in the same patient, implying that the adrenoceptor distribution theory needs further refinement. Since it was first described in Japan in 1991,1 Takotsubo cardiomyopathy (also known as stress-induced cardiomyopathy) has been increasingly reported as a cause of transient focal myocardial dyskinesis following major stress.2 The classic and most frequent variant of Takotsubo cardiomyopathy usually affects the left ventricular apex. However, several cases have described an atypical variant with basal ventricular ballooning (also known as reverse or inverted Takotsubo cardiomyopathy).2-4 Reverse Takotsubo cardiomyopathy is a rare variant of stress-induced cardiomyopathy. Relative distributions of the beta-2 adrenoceptors are believed to determine the different anatomic variants. We report a case of apical Takotsubo cardiomyopathy followed 8 months later by basal Takotsubo cardiomyopathy. A 43-year-old female presented with the chief complaint of acute chest pain following an emotionally stressful event. She had mildly elevated troponin I of 1 ng/mL (normal, <0.057 ng/mL). Chest x-ray was normal. Laboratory workup showed normal complete blood count, bleeding profile, basic metabolic panel, and random blood glucose. Electrocardiogram (ECG) showed no ischemic changes. Transthoracic echocardiography (TTE) showed reduced left ventricular function (ejection fraction of 40%), with apical hypokinesis and hyperdynamic basal and mid segments (Figure 1). Cardiac catheterization revealed normal coronary arteries. The patient was diagnosed with classic stress-induced cardiomyopathy and discharged home on a beta blocker and angiotensin-converting enzyme inhibitor. Follow-up TTE showed normalization of cardiac function. Transthoracic echocardiogram from the patient's first presentation shows apical 2-chamber views of end diastole (left) and end systole (right) and reveals hypokinesis of left ventricular apical segments with hyperdynamic basal and mid segments. Eight months later, the patient presented with similar complaints following another stressful event. She had mildly elevated troponin I of 0.286 ng/mL (normal, <0.057 ng/mL) with no ischemic changes on ECG. TTE revealed depressed left ventricular function (ejection fraction of 30%) with hypokinetic basal to mid segments and spared apical contractility suggestive of inverted stress-induced cardiomyopathy vs acute coronary syndrome (Figures 2 and 3). Given the different echocardiographic patterns of wall motion abnormality compared to the patient's prior typical stress-induced cardiomyopathy with apical ballooning, coronary angiography was performed and revealed normal coronary arteries, supporting a diagnosis of reverse/inverted stress-induced cardiomyopathy. The patient was discharged on aspirin, lisinopril, and carvedilol in stable condition. Repeat TTE 2 weeks later showed complete resolution of cardiac dysfunction. Transthoracic echocardiogram from the patient's second presentation shows apical 4-chamber views of end diastole (left) and end systole (right) and reveals hypokinesis of the basal and mid left ventricular segments with spared apical contractility. 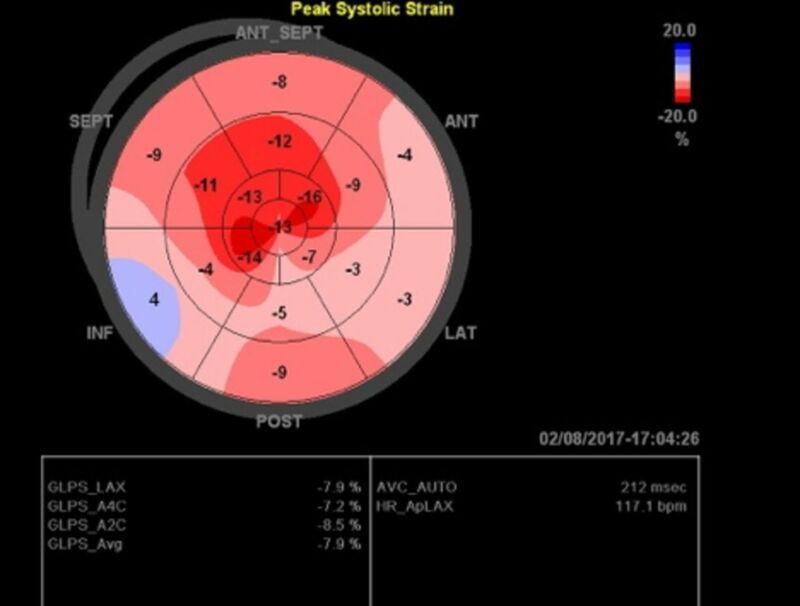 Peak systolic strain reveals attenuation of basal and mid segments with apical sparing. Echocardiographic strain and strain-rate imaging (deformation imaging) is a noninvasive method for assessing myocardial function that can differentiate between active and passive movement of myocardial segments to quantify intraventricular dyssynchrony and to evaluate components of myocardial function, such as longitudinal myocardial shortening, that are not visually assessable. This imaging modality allows comprehensive assessment of myocardial function. Apical, typical, or classic variant: Apical hypokinesia/dyskinesia with or without circumferential mid left ventricular hypokinesia with basal hyperkinesia. This variant is reported for 81.7% of patients in the International Takotsubo Registry. Midventricular variant: Mid left ventricular hypokinesia with basal and apical hypercontractility. This variant is reported for 14.6% of patients in the International Takotsubo Registry. Basal, reverse, or inverted variant: Basal left ventricular hypokinesia with apical hyperkinesia. This variant is reported for 2.2% of patients in the International Takotsubo Registry. Focal variant: Focal left ventricular wall hypokinesia. This variant is reported for 1.5% of patients in the International Takotsubo Registry. Other rare atypical variants: Biventricular apical variant, dysfunction sparing apical tip (possibly a form of the mid left ventricular variant), isolated right ventricular variant, and global variants. The beta receptor gradient theory is one of the proposed explanations of the role of epinephrine in the pathogenesis and tendency of Takotsubo cardiomyopathy to affect the apical segment.11,12 Growing evidence has pointed to a possible switch in the intracellular signaling of beta-2 adrenoceptors in ventricular cardiomyocytes from the Gs protein to the Gi protein as a result of elevated epinephrine levels in Takotsubo cardiomyopathy.11 This switch to the Gi protein is proposed to have protective effects against the proapoptotic forces of intense activation of the beta-1 adrenoceptors with catecholamine surges.11 However, this switch to the Gi protein is also negatively inotropic, and it exerts maximal effect at the apical region which is believed to have the highest concentration of beta-2 adrenoceptors.11 As a result of this biased Gs agonism and the beta-2 adrenoceptor apical-basal gradient, Takotsubo cardiomyopathy tends to affect the apical segment of the left ventricle.12 However, in our patient during the second attack, the basal segment was hypokinetic while the apical segment assumed the reverse role with hypercontractility. This recurrence with a different pattern in our patient, after complete recovery within a relatively short period of time, illustrates that the receptor gradient theory may not fully explain the pathophysiology behind Takotsubo cardiomyopathy. This recurrence affecting a different region of the myocardium may suggest a dynamic expression of beta-2 adrenoceptors where the concentration of these receptors in different segments of the myocardium changes in response to certain stimuli such as ventricular wall stress, hormones, or certain medications. Different anatomic variants of Takotsubo cardiomyopathy may recur in the same patient. Despite the involvement of a different myocardial region, the clinical presentation and the in-hospital course of the recurrent Takotsubo cardiomyopathy can be similar to the classic apical Takotsubo cardiomyopathy. Additionally, the adrenoceptor distribution theory does not fully explain recurrence of the Takotsubo cardiomyopathy at a different myocardial region, as in our case, and hence needs further refinement. In addition, chronic therapy with beta blockers and angiotensin-converting enzyme inhibitors did not prevent Takotsubo cardiomyopathy recurrence in our patient. Therefore, the optimum therapy after the acute phase of Takotsubo cardiomyopathy has yet to be determined.
. Myocardial stunning due to simultaneous multivessel coronary spasms: a review of 5 cases [in Japanese]. J Cardiol. 1991;21(2):203-214. Current state of knowledge on Takotsubo syndrome: a position statement from the Taskforce on Takotsubo Syndrome of the Heart Failure Association of the European Society of Cardiology. Eur J Heart Fail. 2016 Jan;18(1):8-27. doi: 10.1002/ejhf.424.
. An emotional stress as a trigger for reverse Takotsubo cardiomyopathy: a case report and literature review. Am J Case Rep. 2016 Mar 6;17:137-142.
. Reverse or inverted takotsubo cardiomyopathy (reverse left ventricular apical ballooning syndrome) presents at a younger age compared with the mid or apical variant and is always associated with triggering stress. Congest Heart Fail. 2010 Nov-Dec;16(6):284-286. doi: 10.1111/j.1751-7133.2010.00188.x.
. A clinical perspective of the Takotsubo syndrome. Heart Fail Clin. 2016 Oct;12(4):507-520. doi: 10.1016/j.hfc.2016.06.003. Clinical features and outcomes of Takotsubo (stress) cardiomyopathy. N Engl J Med. 2015 Sep 3;373(10):929-938. doi: 10.1056/NEJMoa1406761.
. Apical ballooning syndrome or takotsubo cardiomyopathy: a systematic review. Eur Heart J. 2006 Jul;27(13):1523-1529. Apical and midventricular transient left ventricular dysfunction syndrome (tako-tsubo cardiomyopathy): frequency, mechanisms, and prognosis. Chest. 2007 Sep;132(3):809-816. Systematic review: transient left ventricular apical ballooning: a syndrome that mimics ST-segment elevation myocardial infarction. Ann Intern Med. 2004 Dec 7;141(11):858-865.
. Takotsubo cardiomyopathy systematic review: pathophysiologic process, clinical presentation and diagnostic approach to Takotsubo cardiomyopathy. Int J Cardiol. 2016 Apr 15;209:196-205. doi: 10.1016/j.ijcard.2016.02.012.
. Stress (Takotsubo) cardiomyopathy–a novel pathophysiological hypothesis to explain catecholamine-induced acute myocardial stunning. Nat Clin Pract Cardiovasc Med. 2008 Jan;5(1):22-29. High levels of circulating epinephrine trigger apical cardiodepression in a beta2-adrenergic receptor/Gi-dependent manner: a new model of Takotsubo cardiomyopathy. Circulation. 2012;126(6):697-706.